Log In Now! Your our account number is on your card, and your e-mail address is your password. When you continue to shop and service at Barberino Nissan, you earn cash towards your next purchase! When you enroll in this program, we will pre-load your card with incentive points valued at $250 towards your next purchase of a new or pre-owned vehicle. You will also receive $30 reward points for your next paid service appointment. We are a full service maintenance and repair center with ASE Certified & Factory Trained Technicians. As an authorized Nissan dealer, our customers are assured of the availability of genuine Nissan parts for all vehicle maintenance and repair needs. You can use the $250 in incentive points toward the purchase of a new or pre-owned vehicle at Barberino Nissan. We will load $250 at that time for your next household vehicle purchase as a thanks for your loyalty. With One-to-One Rewards you will earn 3% on all Customer-Pay purchases (pre-tax) in our Service and Parts Departments. You can use your earnings on your next dealership visit or let them build. One Reward Point = One Reward Dollar with the maximum reward redemption per transaction ($300). 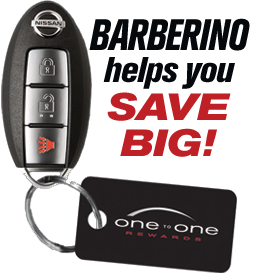 Reward points are earned by making qualified purchases of products/services at Barberino Nissan including service repairs and maintenance, and retail parts/accessories purchased through the Service Department. Some items may earn extra incentive points. See our service advisor for details. Enrolling in One-to-One Rewards costs you nothing. We know how important your new vehicle is to you, we feel the same way about our customers. At Barberino Nissan, we strive to provide our customers with the best sales & service experience possible. The One-to-One Rewards program is a small way for us to say "Thank You" and to provide a unique way for you to save. We have joined with top businesses like Ace Hardware, Best Buy, Choice Hotels, Dell Computer, Expedia, FTD Florist, Godiva, H&R Block, J.C. Penny, Kohls, Lancome, Macy's, Netflix, Officemax, Petsmart, Radio Shack, Starbucks, Toys'R'Us, USA Today, Walmart and Zales. Shop online at one of our over 400 partners through your Nissan One-to-One Rewards account and receive owner points toward your Nissan service/parts points account. This is our way of rewarding our best customers. Shop online with the places you already do business with and get rewards for your vehicle's upkeep! Log In Now! Your account number is on your card, and your e-mail address is your password. 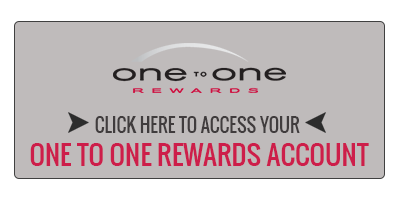 One to One Rewards Points/Dollar have no cash value and cannot be redeemed for cash. Dealer Funded Points will expire after 24 consecutive months of inactivity. You cannot accrue points on new or used vehicle purchases, wholesale parts purchases, warranty, insurance or extended warranty purchases. Barberino Nissan reserves the right to make changes to the program or terminate the program at any time without prior notice.